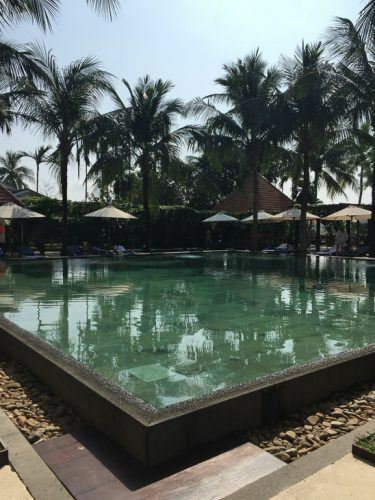 We stayed at the Anantara hotel which I loved. It is a beautiful hotel in a beautiful spot right on the river. 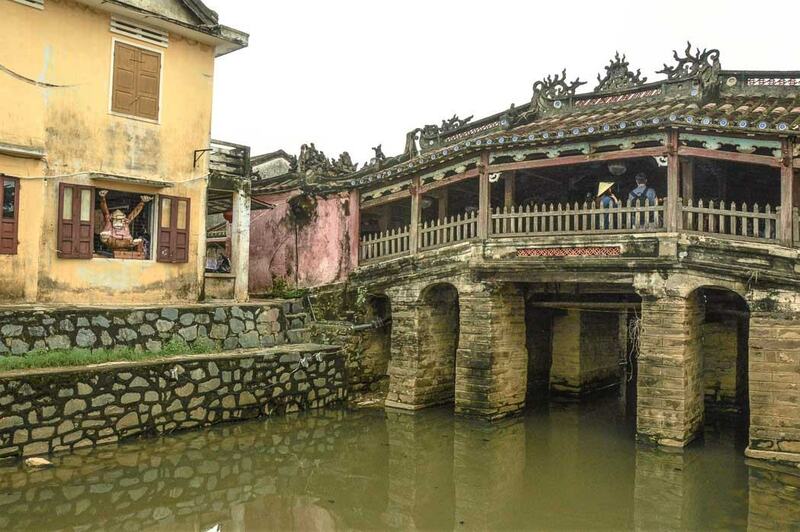 The location is fantastic – you are still in Hoi An but just at the edge of it. It is a quick stroll into the heart of town. Many hotels in this area are on the coast between Da Nang and Hoi An. That is great if you are after a resort-style trip but if you want to explore Hoi An you want to be closer into town. The staff were very friendly and could not do enough. Our room was lovely. The bed was super comfy. There were robes, slippers and lovely smells. Each room has an outside patio and then inside there is a small “living” area and a couple of steps up to the sleeping area. This gave a feeling of greater space. And there is a great pool. The breakfast buffet was a highlight! The setting is stunning – you can sit and enjoy a view of the river. The best bit of the buffet was the amazing Vietnamese pancakes – like a rice paper roll but with a thin omelette, lettuce, shrimp and some kind of fish sauce. A happy marriage between the omelet and summer roll! They also had an egg making station, pho, fabulous looking fresh fruit and great coffee! Another lovely hotel if you want to be close to Hoi An is La Siesta Hoi An Resort. Prices start from a great value USD$72 per night. If you are after something relaxed how about staying in a villa on a lagoon? Le Domaine de Tam Hai is on its own little inlet and scented with frangipanis. Deep sigh! Prices start from USD$120 per night. If you are looking for some more upmarket options check out Fusion Maia and The Nam Hai. Fusion Maia is a stunning beach based luxury hotel on the road between Danang and Hoi An. Prices start from USD$500 per night. If you’re after something super stylish then The Nam Hai might suit you. There is also 1km of private beach and you are only 10km from Hoi An. Prices start at USD$600. I visited Hoi an in January. It was still warm but not too hot which was perfect for me! If you are after sunshine and high temperatures then the high season is from February until July. If you like temperatures a little cooler visiting between February and April is probably best as rainfall is low. If you are looking for more warmth then consider visiting between May and June. 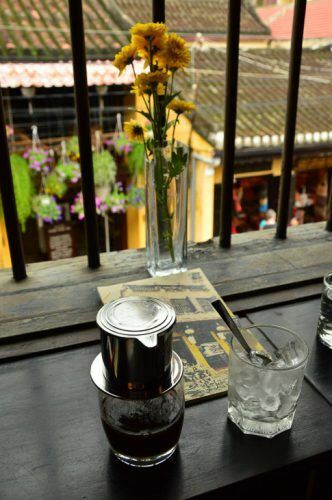 For Vietnamese coffee (served with condensed milk) head for Faifo in the heart of town. 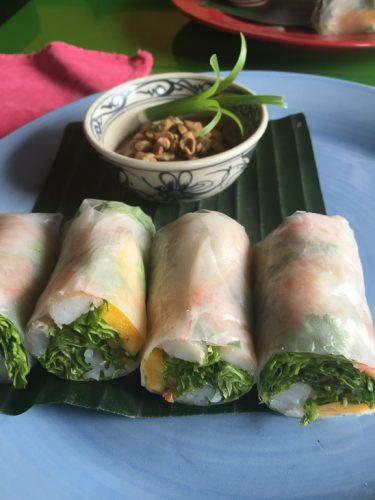 Mango Rooms on the river is also very cute and tasty and serves up Vietnamese fusion like mango summer rolls. 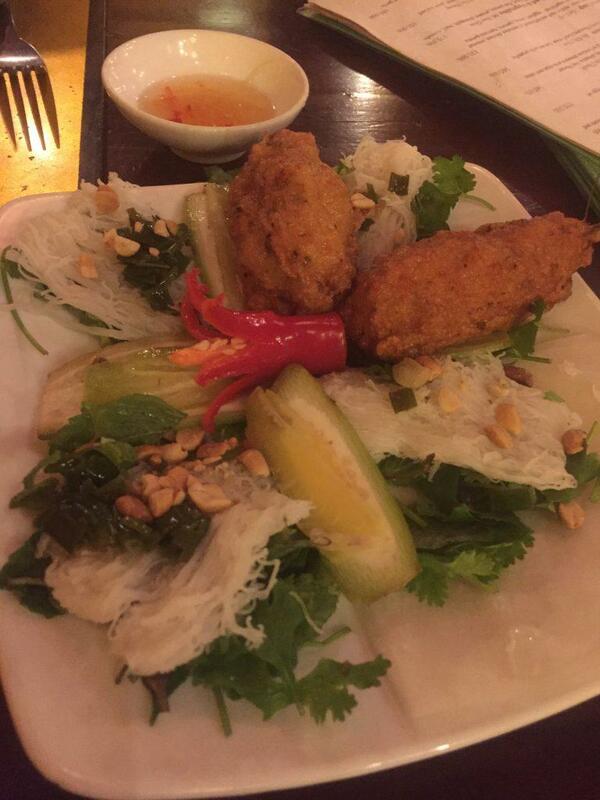 The rocking rolls were like a birds nest deep fried and put into lettuce with some fish sauce for dipping. Like most places in Hoi An it was very reasonably priced. Following on with the Mango theme we then had dinner at Mango Mango. We started off with amazing homemade potato chips with a tomato based salsa. The papaya salad that followed was the right mix of sweet and sour. Next up was the Peking duckling which was served off the bone with sweet potato tortillas and yoghurt. A delicious meal and a great wine list. On our first night we found The White Marble Wine Bar – Hoi An’s only wine bar. This quickly became our pre and post dinner spot! It had a great wine list and a great location on one of Hoi An’s main streets. 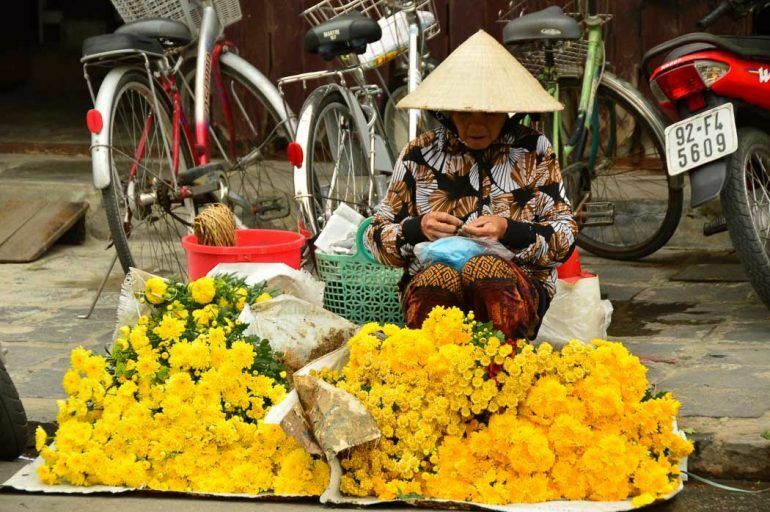 The best things to do in Hoi An involve walking and absorbing the atmosphere. Some areas are of course very touristy but they are still very cute. There is activity on both sides of the river – we only found the other side of the river towards the end of the trip. A favourite in all of the Hoi An travel blog is the Japanese covered bridge which is cute but I’m not sure it’s worth all the fuss. 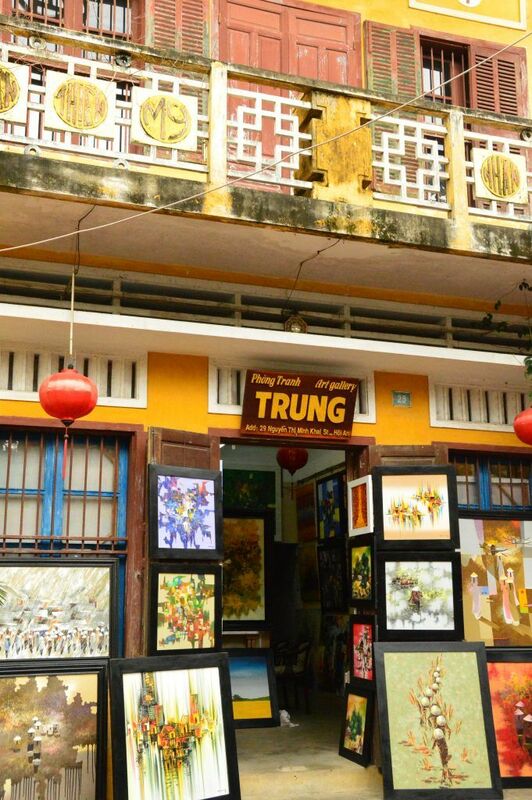 There is quite a bit of interesting art to explore and there are some nice boutique stores tucked in amongst the tourist tat. The area we liked best for art was over the other side of the covered bridge. 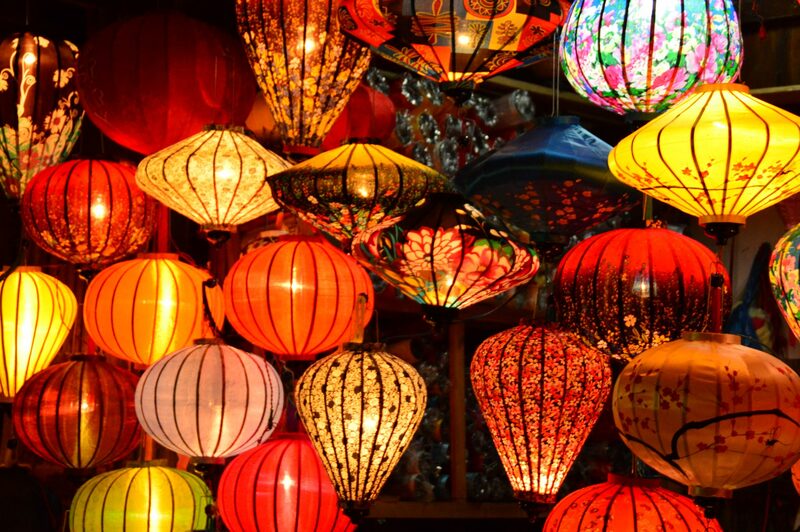 The night market is great for a visit but make sure you get there early as it is all over by 9pm. I got my best shots of the Vietnamese lanterns at the market. 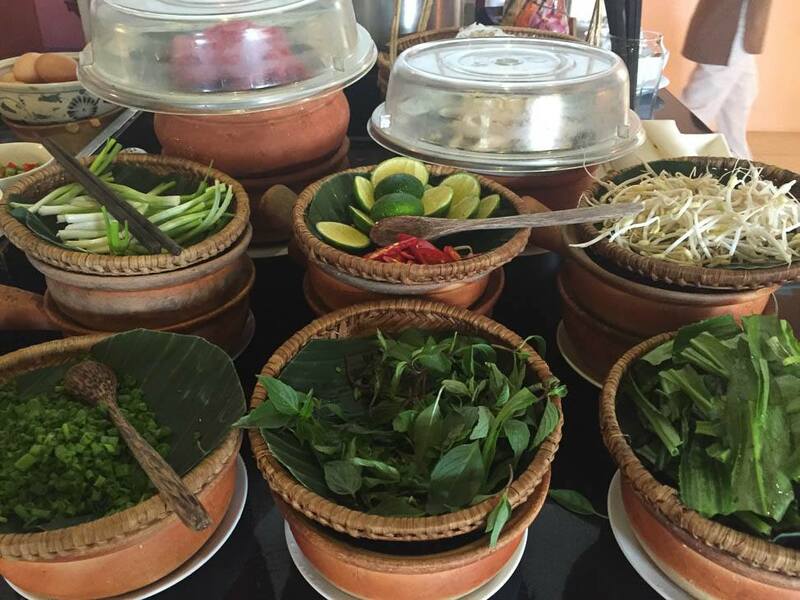 When it comes to what to do in Hoi An for 3 days my number one activity would be a cooking lesson with the Red Bridge cooking school. We met at their restaurant in town in the morning for Vietnamese coffee of course! We were then split into two groups and sent to explore and shop in the local market. We then hopped on a boat and headed down to the actual cooking school. We each had our own “hob” with our ingredients ready to go. The classic Vietnamese pancake was definitely the most difficult thing to cook! Mine kept falling apart. Following this, we all sat down to eat the lunch that we had prepared and it was lovely. Then a boat back to town. A great experience which I would highly recommend. Our hotel had bikes available to guests so I grabbed one and cycled down to An Bang Beach. This took about 15 minutes. Along the way, you can take a right off the main road and get some rice paddy shots. The beach itself was nice but lounges and umbrellas covered nearly every square inch. I then cycled down to the next beach but missed the turn-off! It was then a busy ride back to Hoi An but a nice little workout. There are massage places everywhere. I had a massage at Aaron’s which was 4th on Trip Advisor. It was an excellent Swedish massage. The must do thing to do in my Hoi An blog is to have a meal at Morning Glory. The food here is AMAZING and it is incredibly cheap. And they have some decent wine. I became obsessed with the smoky eggplant and pork. I think we came here 3 times over our stay because nothing was better and I had the eggplant every time! We also enjoyed the beef in betel leaves, pork spring rolls, and the bbq lime leaf chicken. 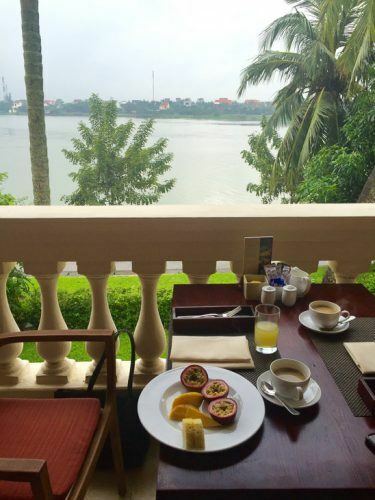 Do not leave Hoi An without at least one meal at Morning Glory. And finally, try Dai at Da Nang airport for a last Vietnamese coffee. It is not the nicest location but the coffee was great. 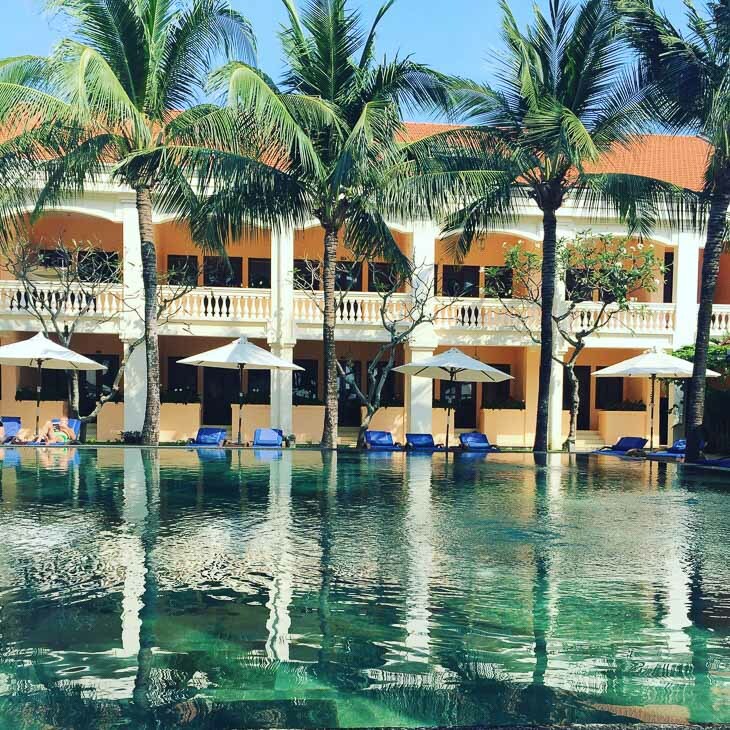 If you’re looking for some support in planning your trip to Hoi An I highly recommend you have a look at Passepartout and have a chat with Laura. Two websites I always look at for information before I travel are Conde Nast and Wanderlust – click on the links to read their articles on Vietnam. I love to take some books with me that really bring to life the destination – here are a few reads to get you in the mood for Vietnam! Don’t forget to take out Travel Insurance before you go. Previous articleThings to do in Medellin: Top 18 Things to Do plus Eating! 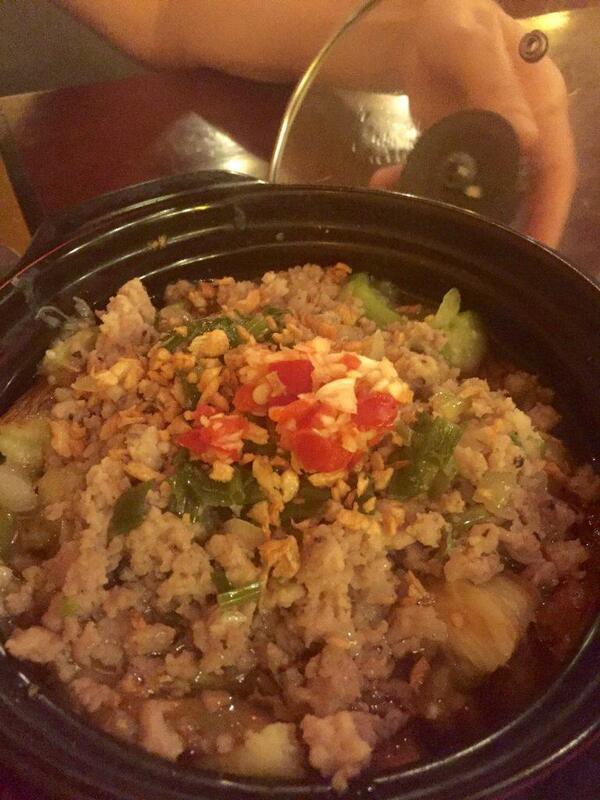 i grew up eating vietnamese food and glad that you had the chance to try it out. the places you stayed looked awesome, i hope you got to try some of the spicy noodle in soup dishes. those are my fave but then again, it’s winter in canada so it’s natural comfort food for me! I will definitely stay at the Mango Room!!! Looks like an interesting place for sure. All the food and drinks look and sound delicious. I like that your right on the outskirts but still close enough to see quite a lot. Thanks for all the detail. Those mango summer rolls look so yummy! Sounds like you had an amazing time! 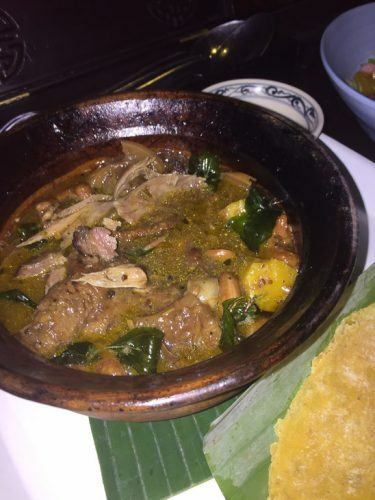 Hoi An is actually a new place for us and this review is definitely a great one as if you transported us there! You got great photographs too! Wow what a great little guide! Hoi An looks like it has some lovely places to eat and visit. I hope to get there one day! Thanks for sharing your experiences. So basically 4 days in Hoi An is a foodie dream! Wow, all those places to eat and each of them look great. Love that you went to a cooking school to learn about the local cuisine! 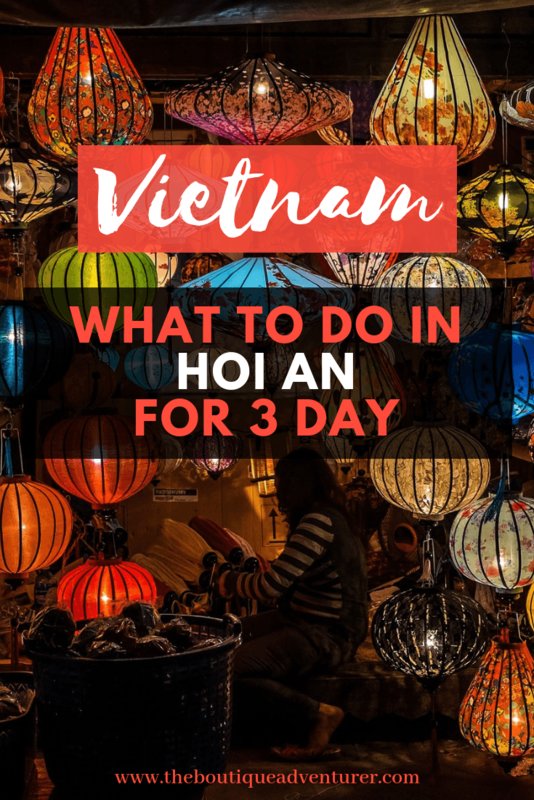 Hi, where about is Hoi An? I have never been to Vietnam and hopefully I’ll get to visit it soon. This place seems a good one to start with. Hi Jem – it is about half way down and just south of danang. It is a great place to start exploring vietnam! 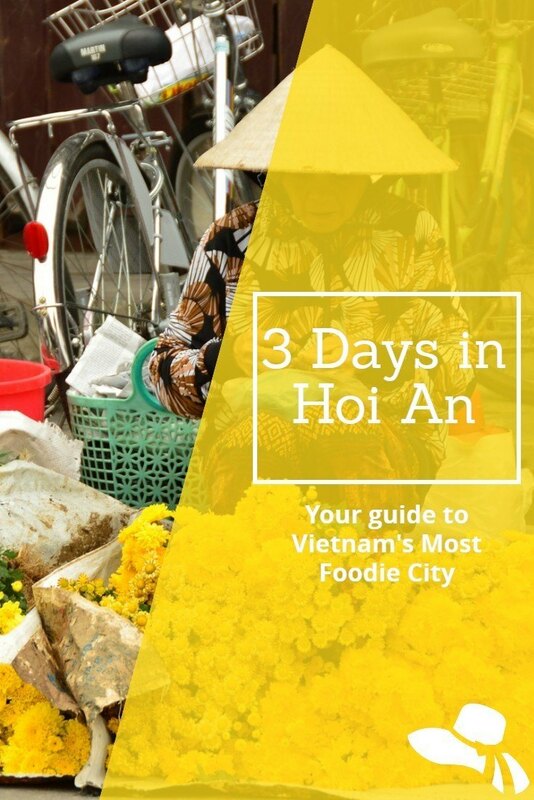 What a great little guide to Hoi An. It’s such a cute little town but there is so much to do there! One of my favourite places in Vietnam! thanks! Banh mi is fantastic!! !